With Kloxo you can chose to run your own nameservers, which enable you to have custom DNS records like "ns1 and ns2.mydomain.com" or you can use the DNS servers we provide for VPS customers. The main benefits to using Kloxo's built in DNS options is you can manage all DNS settings through Kloxo and create custom nameservers. This allows easy management of all domains you create in Kloxo. The downsides are setup can be a bit confusing and troubleshooting is more difficult if you run into DNS issues. If you do not use Kloxo's DNS option you will need to create zone files through HyperVM once you add a domain through Kloxo. The HyperVM option requires no additional setup through Kloxo and "just works". You may find that although this method adds a bit of overhead to domain management it may be the easier choice in the long run. The remainder of these instructions are related to Kloxo's DNS offering. To get started click on the "DNS Templates" icon from the home screen. Click the "Add" button when you are done. You will be returned to the main DNS Templates screen. From here you can edit your templates by clicking on the name in the list. 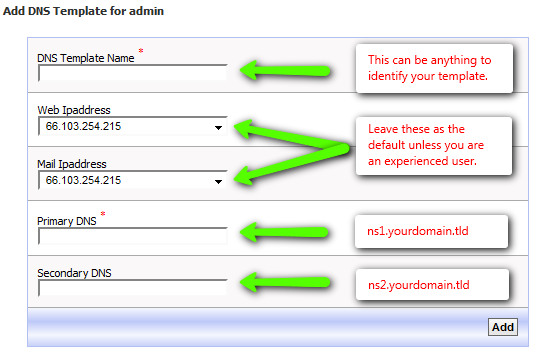 In order for these nameservers to work you will now need to register your nameservers at your domain registrar. Under the "Domain Utilities" heading click the 'Register Name Server' option. A box like the one below will appear to the right. Enter the name server information and the IP address(es) associated with your VPS. You will have to do this step twice, once for each nameserver. ns1 should be the primary IP address of your VPS that was included in your welcome e-mail and the secondary can either be the same as the first, if your registrar allows, or the second IP. in the fields labled 1) and 2) enter the name servers you just registered in the previous step and then click the "Submit Changes" button below the box. This step concludes setting up your name servers. These changes can take up to 24 hours to propagate, although they are usually updated within 30 minutes. When a ping of your name servers returns the IP addresses you registered your nameservers are ready. 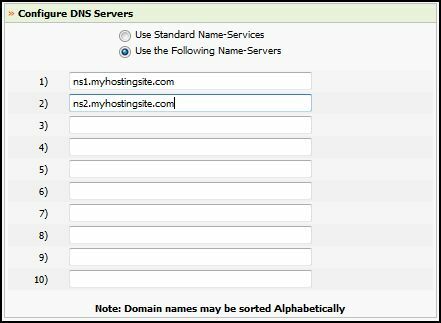 NOTE: As previously mentioned, if your domains are registered with another provider you will need to register your name servers and update your DNS settings in the same manner at your respective registrar.